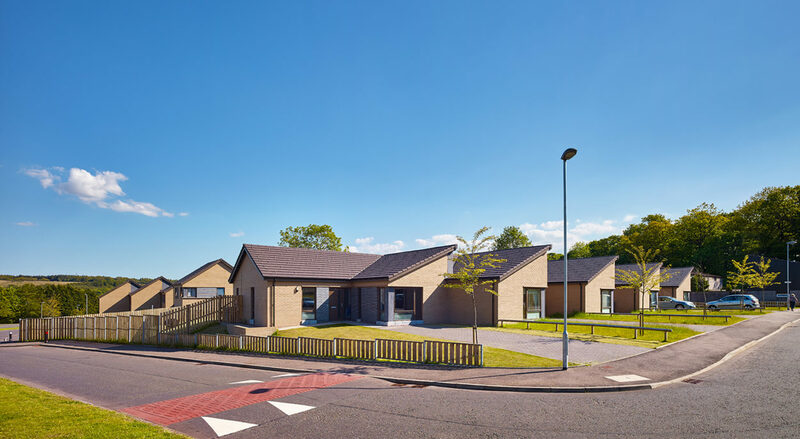 The development for Sanctuary Scotland Housing Association consists of 58 new build dwellings, with a variety of house types to suit differing age groups and family sizes. Providing a diverse mix of house types aims to create a vibrant street scape, by mixing residents of all demographics. Historically, Kildrum was one of the first areas to be constructed as part of the Cumbernauld new town. The site at Ainslie and Maclehose road is located between a highly organised grid of existing housing to the west, and the large sweeping curve of Kildrum road to the east. This interaction has created a complex shape to the site, sandwiching a narrow sloping space between the regimental grid and curved road, with limited vehicle access. The strategy focuses on creating a series of stepping terraced blocks following the arc of Kildrum road with ‘tumbling’ stepped facades. Front elevations predominately face east to bring morning daylight into the main living spaces, the stepped facades allow for exposed gable ends to most dwellings, giving to have a visual connection to the street and exploit solar gain from the south. The rear of the dwellings all have spacious usable gardens, accessible from the kitchen and dining space. Large glazing panels and doors to the rear face south/west to maximise evening light into the garden and dining space. To the North of the site, lies a private enclave of bungalows which will primarily suit elderly and disabled residents. 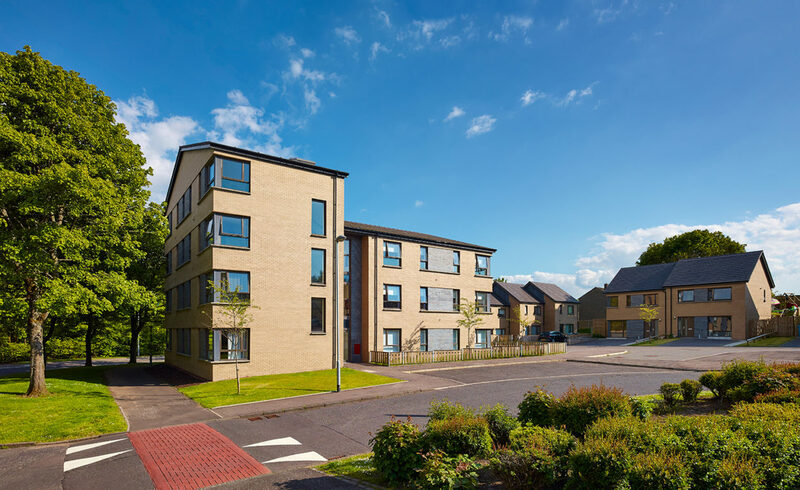 All dwellings complying with the current ‘Homes for Varying Needs’ standards, as well as Sanctuary Scotland’s own enhanced living specification. This in conjunction with a range of family terraced homes and flatted accommodation to the south, will ensure that this development will continue to suit a variety of tenants and their families. The palette of materials concentrates on one main facing brick, with a blue and red feature brick used to provide a flare of colour to the entrance and to the street. Large windows to main living spaces utilise a bullnose header course to the head and stinger cill to the base, framing the windows and feature brick. Designed to out perform the current building regulations and space standards, these new homes will provide residents with spacious and energy efficient living.